The ownership of system files are not with the user, even the administrator of the computer does not have the ownership for system used files. There may be instances where you may want to work with system owned files and Windows Vista would not allow that, there is a script developed by forum user that is called Take Control. 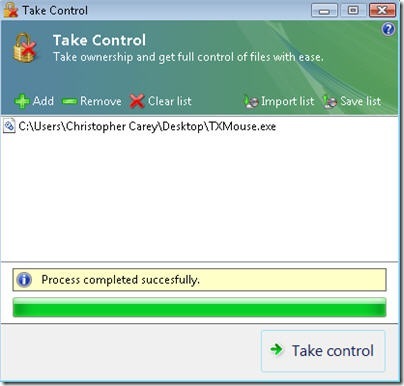 Take Control allows you to take the complete ownership and full control of the system files quickly and easily. It will always be interesting to read articles from other writers and use a little something from their web sites. nice information about (windows vista ownership). keep it up, thanks for sharing. nice to meet you. . I’m impressed by the details that you have on this web site. It reveals how nicely you understand this subject. Bookmarked this web page, will come back for more articles.